After his visit to Paris this week, Syrian President Bashar al-Assad was interviewed by Laurent Delahousse of France 2 Television. DELAHOUSSE: Good evening, Mr President, Thank you for accepting our invitation. First of all, today you met the [French] President Nicolas Sarkozy. It’s not the first time, [as Sarkozy] went to Syria twice. [Note: al-Assad also came to France on 14 July] How would you describe the relationship today between our two countries, France and Syria? AL-ASSAD: With Nicolas Sarkozy, we wished to base our relationship on frankness and transparency. We have built a climate of confidence between us, between France and Syria. Together, we can play a positive and constructive role on questions that concern us in international situations, at least in the Middle East. DELAHOUSSE: Mr. President, this visit today was because, it’s in a particular context, for you, it is urgent in that the peace process in the Middle East is started again. Do you agree that the peace process is simply blocked today? AL-ASSAD: This process is effectively blocked, at least since the Israeli attack on Gaza at the beginning of the year. We should always think about the interest of stability for the interest of peace. And peace, of course, leads to stability. I’m rather inclined towards optimism, even if there is no Israeli partner, and that’s what we discussed with Mr. Sarkozy. DELAHOUSSE: If you came today to see and consult with President Sarkozy, does that mean that you are counting on France to have a role in this peace process? AL-ASSAD: Yes, France can play an important role. They should defend the mediator role of Turkey, and persuade Israel to return to the negotiating table, with the Turkish mediator. We discussed this with President Sarkozy and we think he is able to [help] within the framework of his relations with Israel. DELAHOUSSE: Mr President, it’s now a year that Barak Obama has been President of the US, we may think from what you say for a while that you seem to be disappointed with his diplomacy, is this the case or not? AL-ASSAD: (laughs a bit) We quite agree with the main lines of what he said before he was President, and since he is President, but when we see the result, countries and peoples ask for a plan of action. How to transform this positive talk that we heard into a reality on the field. I can’t talk about deception, it’s less than a year that President Obama is in power, I think therefore that we must give more time to Obama. But I can say that the peoples of the Middle East are beginning to lose hope. I hope they are wrong. DELAHOUSSE: Mr President, you are convinced today that the Iranian nuclear program is only peaceful and not military? 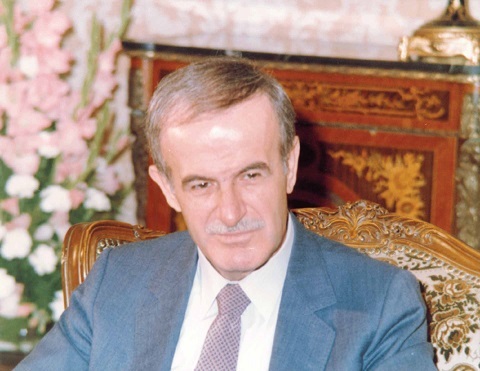 AL-ASSAD: For years we have heard that Iran wants the nuclear bomb, in one year, two, or three years. The crisis began in 2003, and six years later we still hear about a level of uranium enrichment of 5% [that Iran is reaching]. For medical enrichment, you need a level of 20%, and for military levels you need more that 90%. How can one believe that there is a military programme? Logically it’s not convincing. I say to Europe not to believe the Americans, that [attitude of Washington] goes back to in fact the Bush Administration. DELAHOUSSE: Mr. President, France has thanked you twice for the case of Clotilde Reiss [the French student detained in Iran in the post-election crisis]. Do you think that she will freely be able to come back to France? Have you talked to President Sarkozy about this question? 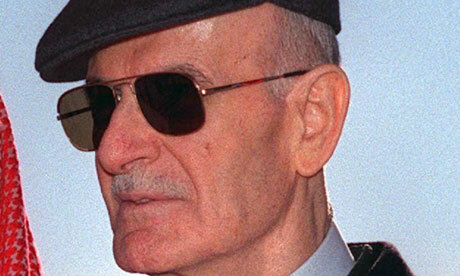 AL ASSAD: I can’t say precisely if Clotilde Reiss will be able to come back to France, it depends on Iran and France. We have transmitted what President Sarkozy has said to Iran in the last few months, but we haven’t intervened since. DELAHOUSSE: Mr. President, do you fear a new escalation of violence in the region? ''Tel Aviv has to understand a clear message: peace is the only thing to protect Israel. If Israel thinks that it is exposed to attacks, it is the peace only to protect it and not war,'' said His Excellency President Bashar Al-Assad to the Turkish 'Hurriyet' Daily, November 8, 2009, pointing out that what Israel and Lebanon witnessed of military means was not in the Israeli interest; but proved to them that they rushed to failure. ''The main source of the problem is Israel's occupation of others' land; there is the occupation of the territories, naturally reactions from the citizens would appear. 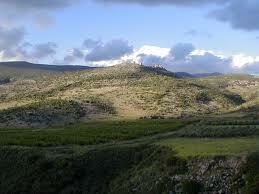 Israel should withdraw from the territories, which it occupied, and sign a peace agreement.'' added His Excellency President Al-Assad. In reply to question about the Syrian-Turkish relations, H.E. 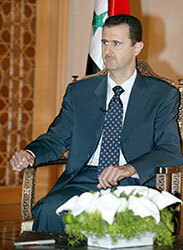 President Al-Assad said: '' Syria and Turkey are two sisterly Countries; with this in mind, we have moved forward. There are perfect bases at the grassroots level; that is way we have made success in reaching to the fast change in our relations,'' citing the importance of Turkey's good relations with Israel as well as with the United States as to realize the much awaited Mideast peace and stability. Rome, Italy, November 8, 2009. Turkey should have good relations with Israel if the former wants to facilitate Syrian-Israeli negotiations, said Syrian President Bashar Al-Assad in an exclusive interview with daily Hürriyet at the presidential palace in Damascus. “Otherwise, how can [Turkey] have a significant role in peace process?” Al-Assad said, when asked if an improvement in Turkey-Israel relations would benefit Syria. Syrian President Bashar al-Assad has said he appreciates the efforts undertaken by Turkey, which rushed to mediate between Syria and Iraq in order to ease the tension that arose between the two countries after several bombs recently exploded in Baghdad. Pointing out that he supports Turkey's democratization initiative, which aims to settle the Kurdish issue, as well as its Armenian initiative, Assad said Syria is ready to do its part to help, particularly with respect to the Kurdish initiative. He noted that whatever its results, Turkey's democratic initiative will also affect Syria. At the Qasr al-Shaab (the People's Palace) in Damascus, where special guests were hosted ahead of Assad's visit to Turkey scheduled for Wednesday, Assad held a press conference specifically for the editors-in-chief of some Turkish newspapers, including Today's Zaman Editor-in-Chief Bülent Keneş. Assad said that if the terrorist Kurdistan Workers' Party (PKK) decides to lay down arms, his country can accept the return of the PKK's Syrian members in support of Turkey's democratization initiative. Noting that they will pardon these militants, the Syrian president underlined that the outcome of the democratization initiative would inevitably affect Syria. “If some people, be they in Syria or in Turkey, decide to abandon terrorist activities, then we must accept and afford protection to them. We did the same thing with the Muslim Brotherhood issue in the 1980s. As a state, we embrace those who have abandoned terrorist practices. We will embrace and pardon again. A state should pardon, because our aim is to eliminate terrorism, not to take revenge,” he said. On the other hand, Assad stressed that they do not welcome the idea of holding direct talks with Israel without Turkey's intermediation. He said they want indirect talks conducted through Turkey's intermediation to reach concrete results before moving on to the direct talks. He also underlined that while they are against any Middle Eastern country's efforts to acquire nuclear weapons, they also do not want Iran to face a military intervention by the US or Israel as a result of this issue. Since the war in Iraq, there have been a number of developments that closely concern Syria and Turkey. After these numerous developments, do you think the region is now safer than before for Syria? 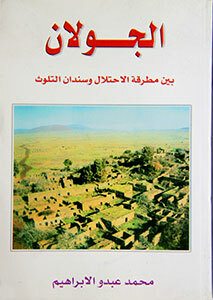 There are both positive and negative aspects to the developments that occurred after the occupation of Iraq. On the negative side, in terms of the consequences of the war, the security situation in Iraq, as we all know, is very bad. Confusion and chaos create a suitable environment for terrorism everywhere. And terrorism will use this environment in order to strike other countries. In this respect, the postwar region is no more stable than before. But, as you know, there are always “buts,” and there were things that we have learned from this process. In the first place, we must note that we have learned that the attitudes and views of Turkey and Syria were right and correct. As you know, before the war in Iraq, the leaders of some countries had come to us and lectured us. But, it came out that they were wrong and we were right. By the way, we have learned another thing: The solution offered from outside the region does not always solve the issue. We have insistently asserted that this occupation will not be a solution, but will have destructive effects. That is, we need to make this distinction: We need to stress that there is a difference between having good relations and surrendering. As you know, Iraq claims that Syria is responsible for the recent bombings in Baghdad. What do you say in response to these accusations? What do you think of Turkey's intermediation efforts between the two countries? Can you say that the problem with Iraq is close to being settled? Turkey's intermediation efforts arrived really quickly. Timing was an important factor. Moreover, Turkey's approach was really objective and realistic. As a matter of fact, Turkey's general approach is, “If some problems arise among my neighbors, this will affect me in some way or another.” Before Turkish Foreign Minister Ahmet Davutoğlu came to Damascus, Prime Minister Recep Tayyip Erdoğan called me, and I immediately responded positively to his offer of intermediation and supported Turkey's efforts. In several days [on Wednesday], we will hold a meeting in Turkey to discuss this problem. But Syria was held responsible for the explosion in Baghdad. And Iraq accused your country. What really happened there? We were really shocked to hear those accusations because we had signed a strategic cooperation agreement with [Iraqi Prime Minister Nouri] al-Maliki only two days before. Moreover, about 1.5 million Iraqi refugees are living in Syria. Despite this, we are accused of killing Iraqi people. 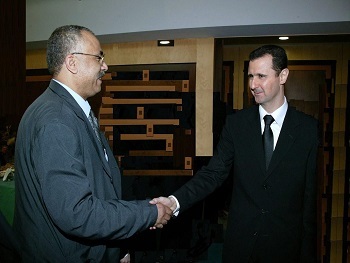 Some claim that Baathist insurgents are backed by Syria. Such a thing is illogical. The problem is inside [Iraq]. There is an atmosphere of conflicts and clashes in Iraq, but Iraqis tend to put the blame on external forces, and they accuse us. Since 2004, they have applied to us many times, demanding that we extradite people from the Iraqi opposition to them. But they do not offer us any proof of the crimes these people are accused of. We tell them that we will give those people to them if they submit evidence to us, but until now, they have failed to provide any such evidence. Turkey will soon hold a joint cabinet meeting with the Iraqi government, and it has been declared that it may hold a similar meeting with Syria. What is the Syrian side's approach to such cooperation? Do you welcome this proposal? During my visit to Turkey, we will clarify this matter. There is already a similar mechanism in place between Syria and Iraq. It is our opinion that any good relations between two neighboring countries will prove beneficial to all neighbors. For instance, if Turkey had not had good relations with Iraq, how would it have been possible for it to initiate intermediation efforts between Iraq and us? For this reason, if bilateral relations are improved to the highest extent possible, this will be beneficial to all countries in the region. Turkey has recently launched an initiative to open the common border between Turkey and Armenia. Simultaneously, it has launched a Kurdish initiative. The Armenian initiative may not be of much interest to you, but how do you think the Kurdish initiative will affect Syria? How do you see these initiatives from the Syrian perspective? 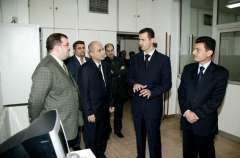 The President of Syria has issued a historic invitation to his American counterpart Barack Obama, to a summit in Damascus in an exclusive interview with Sky News. Bashar al Assad told Sky's Middle East correspondent Dominic Waghorn he wanted to meet the US President on Syrian soil to discuss peace in the region. He asked Sky News to relay the invitation to Mr. Obama. When asked when the visit could take place, he said it was up to the Americans to decide. Asked if it the meeting could usher in a new era in the region, he said yes, if peace could be secured. The invitation is very significant. It moves Syria and the US directly towards detente after years of hostility under the Bush administration. “It's normal to have differences between different cultures, between different nations and states. But I think the United States has a special role as the greatest power.” Syrian president Bashar al Assad speaking to Sky News. It is a direct response to the olive branch being offered by Barack Obama in recent days, especially his decision to send an ambassador to Damascus for the first time in four years. The Syrian President also said he was in favour in principle of renewing indirect talks with Israel, provided the right mediator could be found. 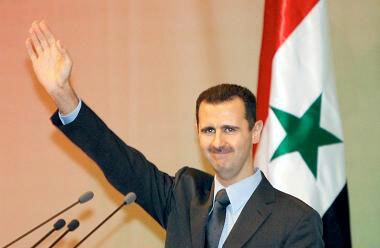 Mr. al Assad said: "We would like to welcome him in Syria, definitely. I am very clear about this."